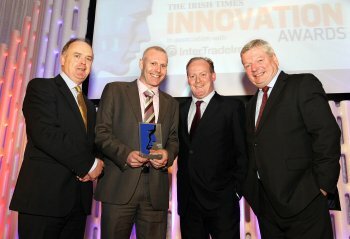 University of Ulster expertise took centre stage in Dublin last night when pioneering research and development business projects were showcased at The Irish Times All-island Innovation awards in association with InterTradeIreland. The Altnagelvin-based project C-TRIC took the top prize for a cross-border innovation project, while Clinical Conduct Associates – a Fusion project – was runner-up in the same category at the prize-giving held at a gala reception at the Irish Museum of Modern Art in Dublin. Seventeen organisations were shortlisted in six categories from 282 companies and organisations that initially registered in the competition. C-TRIC (Clinical Translational Research and Innovation Centre has been developed as a joint partnership between the University of Ulster, the Western Health and Social Care Trust (Western Trust) and Derry City Council, with funding for the project provided by ILEX urban regeneration company and Invest Northern Ireland. The purpose built unit in the Altnagelvin Hospital site in Londonderry brings healthcare, technology and research under one roof to facilitate the development of innovative products and services. The only facility of kind in Ireland or Britain, Its “bench to bedside” approach aims to reduce the time to market and costs associated with R&D in health technologies, medical devices and therapeutics. Clinical Conduct Associates (CCA) is a contract clinical research organisation providing drug and medical device services to the pharmaceutical or biotechnology industries worldwide. Its headquarters are in Cork and it has offices in the UK and mainland Europe. CCA has developed a new online patient recruitment and screening database for clinical trials for multi-national biotech and pharm companies, with assistance from InterTradeIreland’s Fusion programme.Key University of Ulster personnel who are involved with the projects attended the awards ceremony. Eddie Friel, Head of Business Liaison and Academic Enterprise at the University of Ulster Office, who is based at Magee, said:“This is a huge morale boost everyone involved in C-TRIC. Having come so far in our first year of operation will obviously add to our growing international prestige. "Next on the agenda for us is our second Translational Medicine conference, which will take place in Derry on April 29th and 30th, which is already generating a lot of interest among people in the sector in many countries. Liam Nellis, Chief Executive of InterTradeIreland, commented: "Innovation is critical to the future of both economies on the island, North and South. Now, more than ever, businesses need an innovative and enterprising culture for commercial success and growth.